It’s 1885, and Billy and Tommy McBride, Australian teenagers in a drought-ridden wilderness, have grown up within the confines of their family’s failing cattle ranch. They’ve met few people other than their parents, younger sister, and hired hands, and they’ve felt themselves secure within that society. So when the boys return home one afternoon following a rare moment of leisure, an excursion to a swimming hole, they see that they are bereft beyond their imagining. Someone has murdered their parents, gravely wounded their sister, and even killed the dogs. Suspicion immediately falls on a former Aboriginal hired hand who’d left the McBrides’ employ under a cloud, and whose distinctive pistol is found at the scene. At least, sixteen-year-old Billy’s convinced of the man’s guilt, precisely what the McBrides’ wealthy neighbor, John Sullivan, wants to hear. He’s a rancher who seems to own everything and everyone, hates anyone who’s not white, and anyone of any race who doesn’t pledge him fealty, which he calls “respect.” Sullivan hires a police officer and his Aboriginal troops to hunt down the killer, and he insists that both boys come along. But Tommy, almost fifteen and forever in his older brother’s shadow, isn’t so sure. He mistrusts Sullivan, with whom his father never got along, and, unlike his older brother, wants to know the how and why of things. I like this facet of the novel very much, how the interplay between the brothers sets so much into motion. Billy, pigheaded and more terrified than he’s willing to admit, accepts all he’s told as the only choice and refuses to ask questions — sometimes the obvious ones. After all, the McBride boys are orphans, and as minors, they have no rights to hold their deceased parents’ property. Tommy acquiesces because he can’t exist on his own, idealizes Billy, and wants just as much to be accepted. Yet he keeps a skeptical mind about what doesn’t make sense, including details of the murder that don’t add up. And he tries to ask questions, only to be shouted down or threatened. But Howarth is after bigger game than sibling rivalry, however deadly it may turn. He aims to explore how murder — what today would be called genocide — can happen, and how decent people can subscribe to it. So far, so good, but I wish the author hadn’t stacked the deck. Sullivan speaks and acts the way I imagine such a man might, yet his villainy and lust for power seem too grand and without nuance. (There’s also a Freudian cliché employed to explain why he throws his weight around, but it’s too cheap by half.) Far more interesting, and complex, is Noone, the police officer Sullivan hires. At first, Noone cultivates Tommy, whom he senses has an astute, roving intelligence like his own. To Tommy’s surprise, Noone even answers questions about Sullivan’s questionable activities, the boy having assumed that the two men trust one another, if they’re not actually friends. But Tommy soon learns that Noone trusts no one and has no human feeling as the boy (and just about anyone) would define it. Noone’s a thinker, a theoretical follower of Darwin who’s twisted “survival of the fittest” to his murderous agenda. His kind is timeless; call him proto-fascist, white supremacist, sociopath, or all three. The dray rattled along, Mother holding her hat against the wind, Tommy squinting into the glare, both of them grimacing at the ride. There was no give in the axle. Every rock and divot jarred through the bench. Before them the road stretched straight and narrow, little more than a horse track beaten through the bush, but the only road Bewley had. It ran through the center of town and continued east for hundreds of miles, supposedly to the mountains then the coast and an ocean so big it covered half the earth. Tommy could hardly imagine it. But then the same could be said of the interior, which no man had ever crossed; must have been the size of an ocean at least. The thought made him woozy: the scale of it all, what lay out there, the world. Only Killers and Thieves lives up to its title, a grisly, powerful, unflinching book, the type you don’t want to put down but fear to pick up once you have because of what might happen next. After a taut, laconic narrative, however, the climax gets talky, with Noone spewing stuff that seems pulled out of Nietzsche, irrelevant and redundant. The entire dénouement, in fact, feels stilted and arranged. 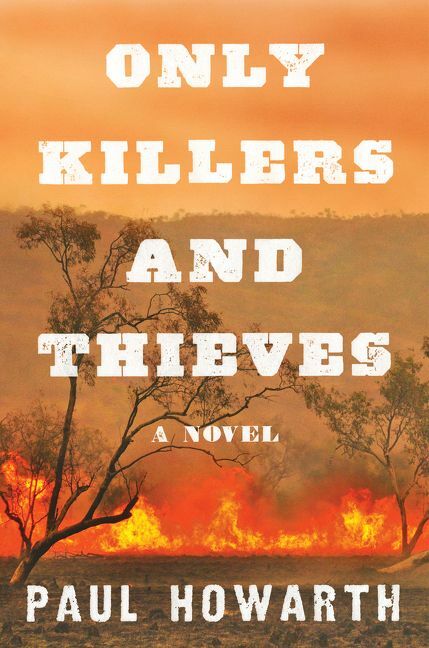 But Only Killers and Thieves is a brilliant novel, more remarkable for being Howarth’s first. I think he’s an author to watch.